If your company does business in a specific region or area such as Cleveland or Columbus, then your local SEO rankings should be top of mind when it comes to your digital marketing. With local SEO, you are optimizing your website in order to target people within a certain geographic area and trying to get them to call, come to your store or business in person, or visit your website. While there are many things you can do to improve your local SEO, here are some of our top tips. Throughout the last year or so, local profiles such as Google My Business and Bing Places have become even more important when it comes to local search. In fact, in a 2018 Local Search Ranking factors study, Google My Business accounted for 25% of local pack/finder ranking factors. This makes it even more important that your local profiles are claimed and updated with the correct information, but there are also ways to optimize your local profiles to increase visibility and make it easier for customers to find you. In addition to creating your local profiles, it’s important to frequently update them as well. This includes adding new photos or videos on a regular basis, responding to reviews, and answering questions as they come in. As local search becomes more important, updating your local profiles will become as vital as updating your social media accounts. Google has already shown that it will favor regularly updated profiles over those that aren’t, and this trend shows no sign of stopping. In addition to adding photos and responding to reviews, Google also has a feature that allows you to easily update your local profile with recent news, promotions and events. These Google posts typically last 7-28 days, depending on the event or promotion deadline, and serve as a great resource to give potential customers important information about your business right within the Google search page. Writing regular Google posts, as you do with other social accounts, can help keep your profile active and drive potential customers to your website. Building your backlink profile is a great way to help improve your rankings in both local and national search. One quick way to achieve this is by reaching out to organizations or groups that you and your business belong to and asking for them to add a link to your website. This may include your area chamber of commerce, any community partnerships, and even events that your business sponsors. As search engines are evaluating your site, they will review what websites are pointing to yours and the better your backlink profile the higher your site will appear in the search algorithm. This is especially important when it comes to local search because search engines will rank you higher for the more local links you have pointing to your website. For example, if Flower Shop “A” has backlinks from the local chamber of commerce, is linked as a preferred vendor for a local wedding venue, and has links from local bloggers, that business is more likely to rank higher than another flower shop in the area without those links. Another tactic many marketers utilize for local search is on-page or on-site optimization around specific local keywords or phrases. There are several ways you can go about this. If your business functions within a set geographic area, for example, you can use instances of city-specific keywords throughout your website. For many, though, their businesses operate in a larger area, or maybe even compete nationally. If this is the case for your business, then you may want to invest your time in creating city-specific pages that can function as landing pages to bring people deeper into your website. The basic idea is to combine keywords you want to target with the name of the specific city to create a unique city page full of relevant content that can help people within that area find your business. 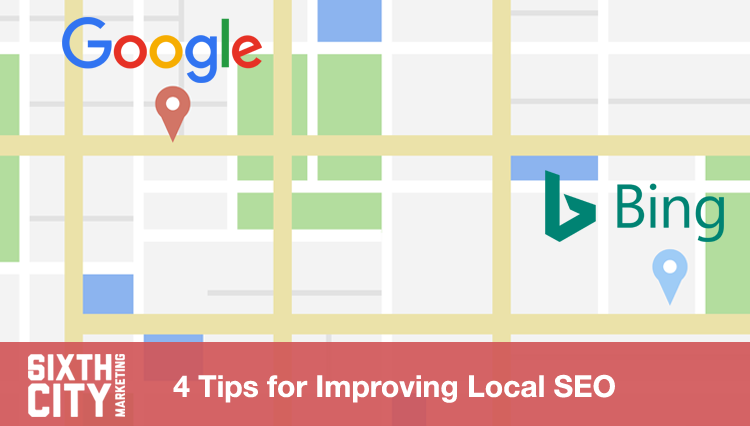 Want to learn more about local search and how your site currently ranks? Contact us today and we’ll be happy to do a free website evaluation for you.